With the spring and summer 2016 Fashion Week runway shows done, having moved from the streets of New York City to palaces of London, the operas of Milan to fashion districts in Paris, we begin to pull together the reports of all the different trends, including the gorgeous spring/ summer 2016 print trends that could be seen on those masterfully presented collections strutted down the catwalks around the world. We’ve seen designers of all ancestries appear, from European to Middle Eastern, American to Asian, and each had his or her own flair to show off to the awaiting crowds who, themselves, looked quite fashionable as the warm summer days gave way to the cooler autumn winds. 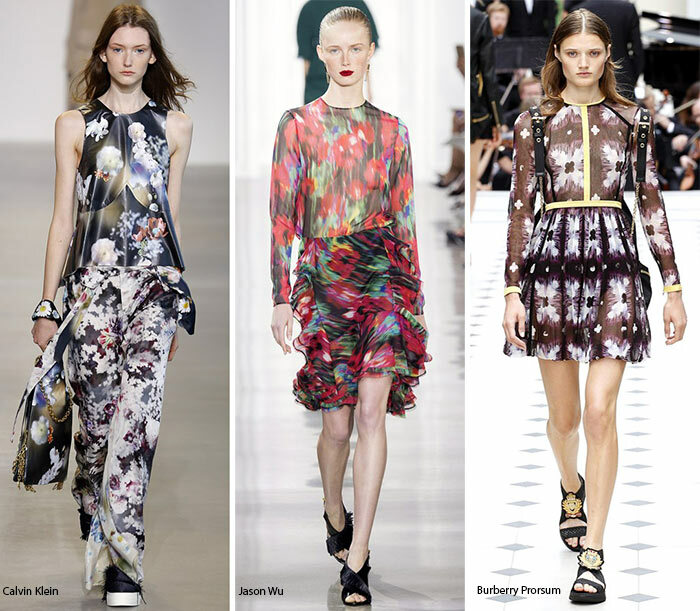 One of the biggest trends on any Fashion Week, aside from the actual cuts and the colors, is the existence of prints. We see all types of prints appear on that runway, with all different ideals by each artist as to how best one captures the imagination on fabrics of all types. We’ve seen everything from tie-dye to animal prints, pretty florals and everything in between this season. 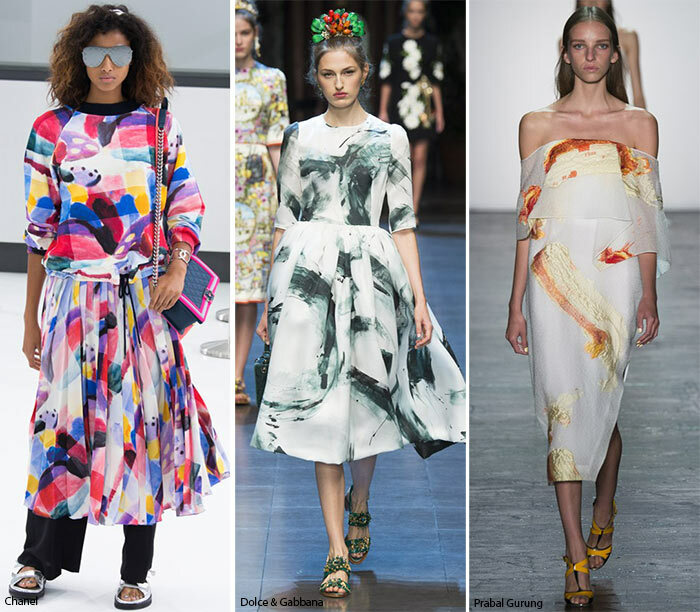 But there are a few prevailing spring/ summer 2016 print trends that have gotten our attention and we would like to share those today. Gingham patterns seem to be in for a few seasons now, though it has only gotten bolder for 2016. There is a bit more accenting to it now, a bit more color and a touch more creativity. We see intriguing gingham fading into abstract floral print dresses appear on Marc Jacobs, worn head to toe. Thakoon brought in some gorgeous works that gave gingham a softer, more amiable appeal, while Victoria Beckham’s vision for the trend included more contrast, a bit more subtlety in changing colors and plunging necklines on dresses reaching around the ankles. Zac Posen made it look almost Victorian in stylization, pockets on dresses showing off décolletage and all, as the Marissa Webb girls strutted down in sleeveless, full bodied pieces that were all about the slouch and the comfort. 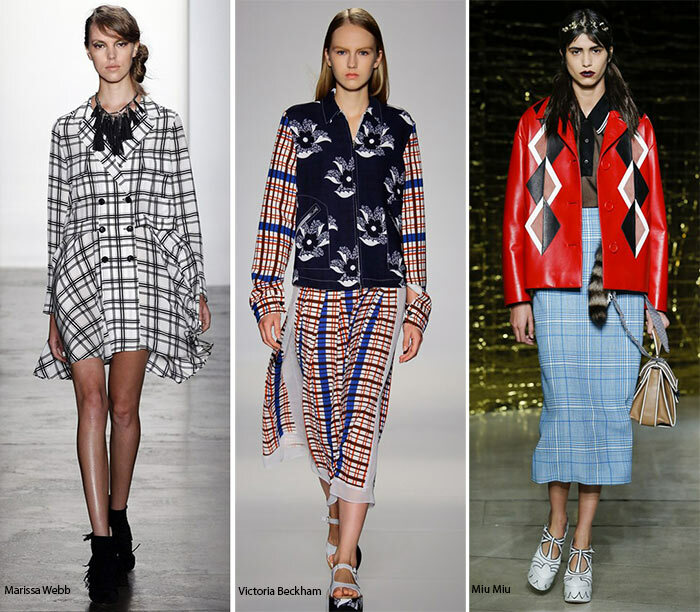 Wes Gordon gave schoolgirls a new outfit as well, pleated skirts and triangle top additions only adding to its appeal as gingham prints took over the whole getup. Stripes are to summer what fur is to winter it appears, at least in the fashion world. It is a warm weather classic that has been around for ages, or at least many decades and has been getting an update on an annual basis. This time around, it brings out eclecticism in the garments worn, making Tome’s multiple layers of stripes that much more on the attractive side. Anna Sui has bee maze mini dresses with thicker striped jackets thrown over the shoulder and matching colored shoes, while Alexander Wang takes bowler shirts, adds a bit of baseball to it and then thickens the stripes on a longer jacket in order to achieve the punkish look he loves to opt for. High waists on retro striped pants cropped at the ankles appear on the Marc Jacobs runway, while striped wraparound shirts tucked into wraparound skirts give Public School a good amount of public adoration. 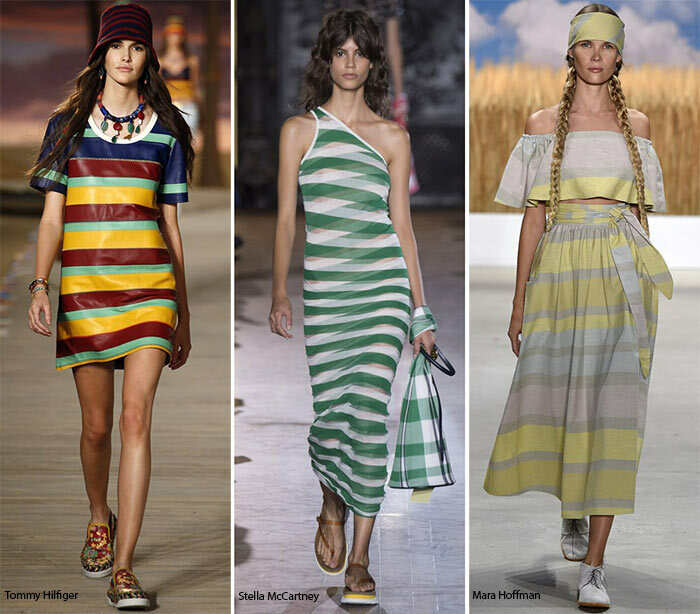 Stripes of all colors and alignments appear at Tanya Taylor, while they come in arrowhead designs at Tommy Hilfiger. 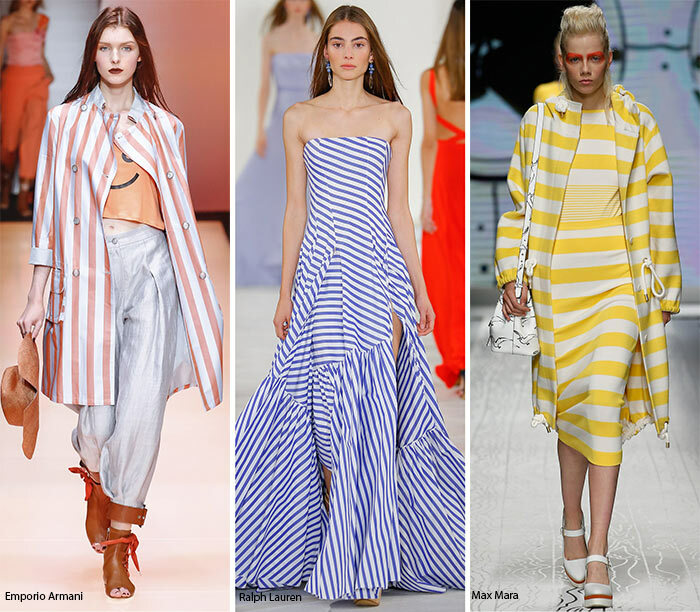 Long shirtdresses with slits up the sides appear in predominantly white stripes at Nill Lotan, while there are plunge necked jumpsuits at Missoni and rather wide pants in candy colors on the J. Crew runway. J JS Lee brings in sherbet-colored stripes in pink, lime and blue on the first day of the London Fashion Week, while horizontal banded Bardot stripes appear on the Riviera swimwear seen at Sibling. We see rainbow stripes painted diagonally down at Jonathan Saunders, the stripes also coming into play at Ashley Williams, Gareth Pugh, Preen, Peter Pilotto and others. Banded knits, extreme stripes, monochrome jigsaws and fine stripe surfaces are a common enough look for the upcoming seasons, making stripes possibly the best possible trend to go with. Colorful stripes at Isa Arfen really do us in with the pink and green combo. Dior brings in vertical thick stripes, while it is all about the candy colors at Stella McCartney and bare shoulders at Salvatore Ferragamo, and Bengal stripes at Ralph Lauren. Prada brings in the black white and yellow combo, while Tommy Hilfiger goes traditional here. And then there are those pajama sets at Dolce & Gabbana followed by candy stripes on light and pretty coats as per Emporio Armani. We cannot help but fall in love with Milly’s dresses though, beachy effects and all. While floral prints have been a big thing over the past few seasons, they are split into abstracts and rather realistic designs this time around. The abstract is even more intriguing than expected though, what with the gauzy skirts and very summery bodies lending to its appeal. Jason Wu brought in the abstract floral patterns for spring 2016 on a black background, with the colors muted and flattering against the tanned body. Abstract florals appear on Calvin Klein Collection’s pajama pieces, the set including a robe and shoes to go with the shirt and ankle cropped slouchy pants. 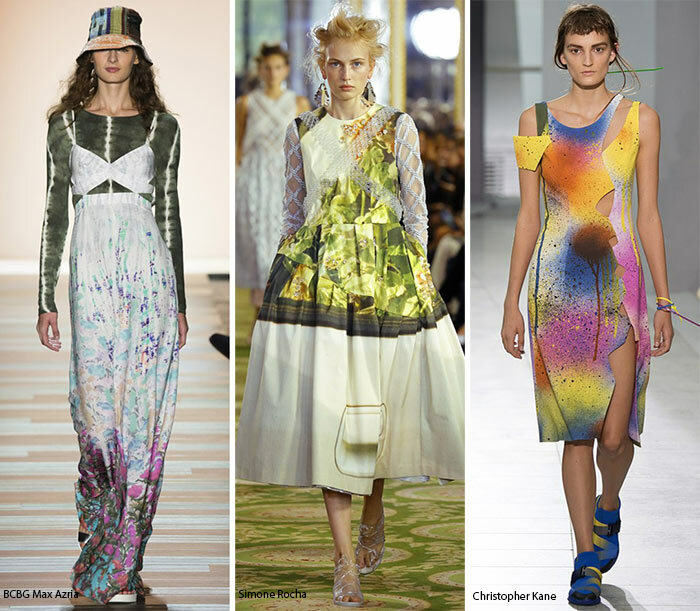 Abstract looks awesome with print blocks as well, something seen on Mother of Pearl, Duro Olowu and Mary Katrantzou, among others. The realistic combines with the abstract in florals at Creatures of the Wind, particularly on the raw hemmed designs. Gabriel Cadena makes bare shoulders and mini dresses look astoundingly gorgeous with the blue hydrangea to diver hued gradient patterning, abstract florals and all. 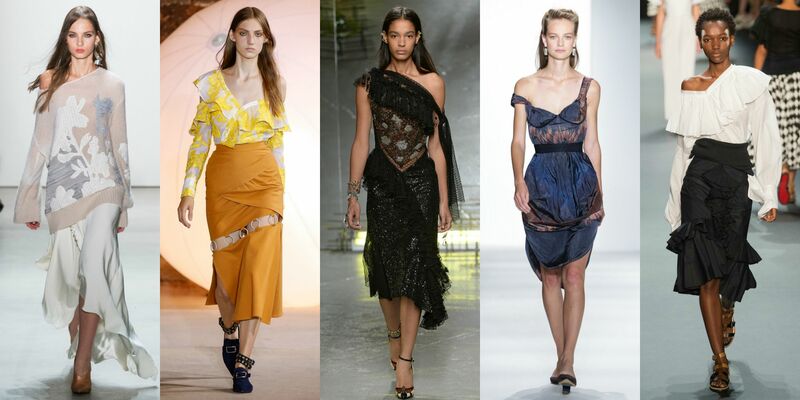 Add Phillip Lim to the list here as it appears with creeping floral vines, and a frilly feminine countenance. Gorgeous floral lace appears on stockings at the Rodarte show as well, while they look almost psychedelic at Burberry Prorsum. We love it when we can tell just what type of flower is depicted on a certain piece of an outfit. That is what makes Trina Turk’s daisy embellished tight fitting cropped pants in aqua, white and buttercup yellow that fantastic for a customer. It is bright, it is sunny and it is perfect for the spring and summer seasons. You see lilies appear at Whit on off-the-shoulder dresses in green and white, darkly smudged exotic flowers at Daks, chiffon creepers at Jasper Conran, batik leaves at Zandra Rhodes, as well as foxglove and wisteria at Giles Deacon. Alice Temperley brought in inspirations from Havana, while Victoria Beckham had fun with her Moroccan exotic flora. Gucci brings in tiny little white bud on a green background, making the jock letter jacket into a very feminine entity. Pretty red and blue flowers against a black background appear at Tanya Taylor, appearing quite lovely with their bare shoulders and looser feeling to the dresses. It is a field of daisies when it comes to Creatures of the Wind print blocking, wherein it appears more of a black & white versus color combinations. Those fields extend to bluebells it seems with Michael Kors looking fantastic in New York, and Suno giving us a rather intriguing view of its beauties. Kate Spade, on the other hand, simply screams flower power! Possibly one of our very favorite spring/ summer 2016 print trends is the whole tie-dye thing with the modern twist. 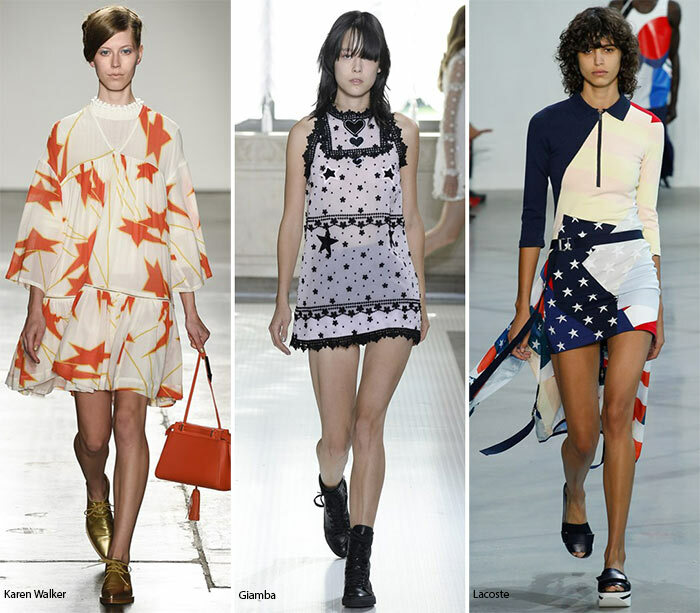 It is nothing like the hippie colored t-shirts, but very much more on the chic side, with the cuts making it even more attractive for the women of the world. We see gorgeous beachside dresses including the asymmetrical pinned up plunging neckline and high slit dress in green yellow and black seen at Altuzarra during the Fashion Week. Altuzarra has multiple pieces sporting this look, including a gorgeous beach signifying piece with short sleeves, a rounded neckline and a small slit up the side of the thigh. The trend takes on a very modern feel at BCBG Max Azria as well, with a bit of a sportier daytime look to it, while Thakoon combines tie-dye prints with plaid for the ultimate effect. 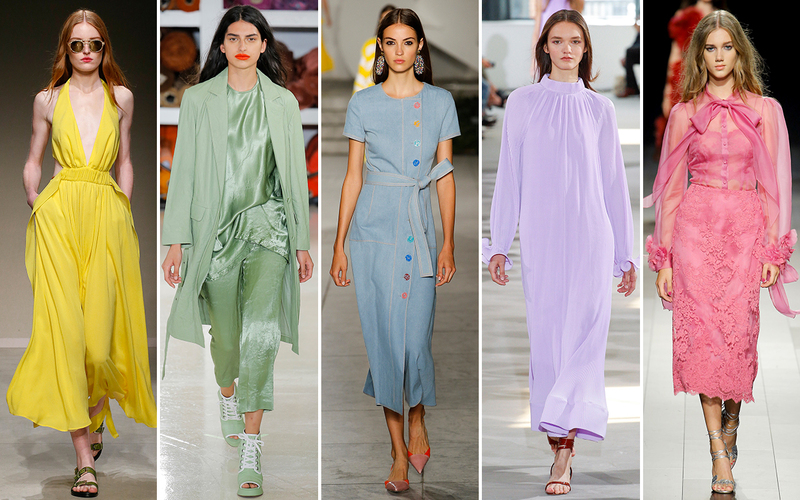 Rachel Comey brings in tiny sleeved tunics in Diver hues and white, while it’s all about the bold and the beautiful at Baja East. Gorgeous skies take over at Emilio Pucci, making those matching blouse and skirt looks appear all the more delectable, while it is a splatter of army we are looking at come the infamous Valentino collection. 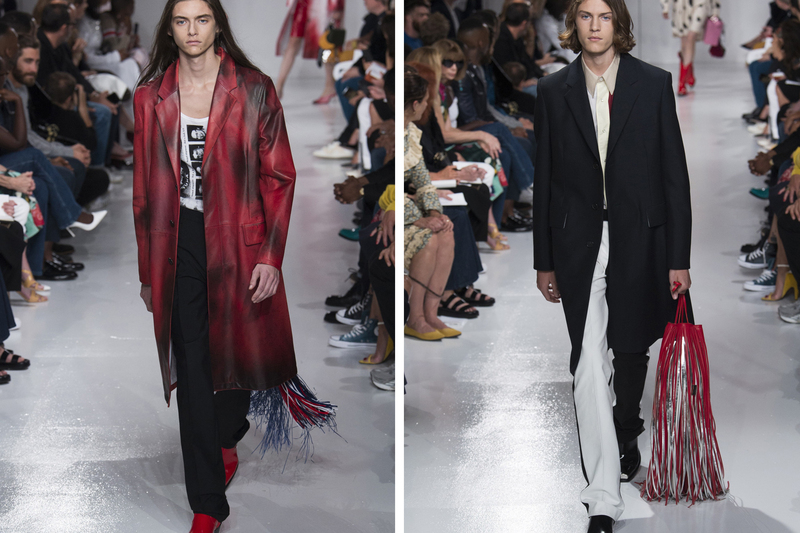 Pretty little tie dye dresses appear at Paco Rabanne, with huge rings forming on the slips at Narciso Rodriguez and the spring coming down lower to pants at MM6 Maison Margiela. We love Hawaiian prints. We love them when they appear on shorts and shirts, especially for men, and we certainly love it when they play peek-a-boo and camouflage games with us on women’s fashion as they did for the upcoming spring and summer 2016 seasons. 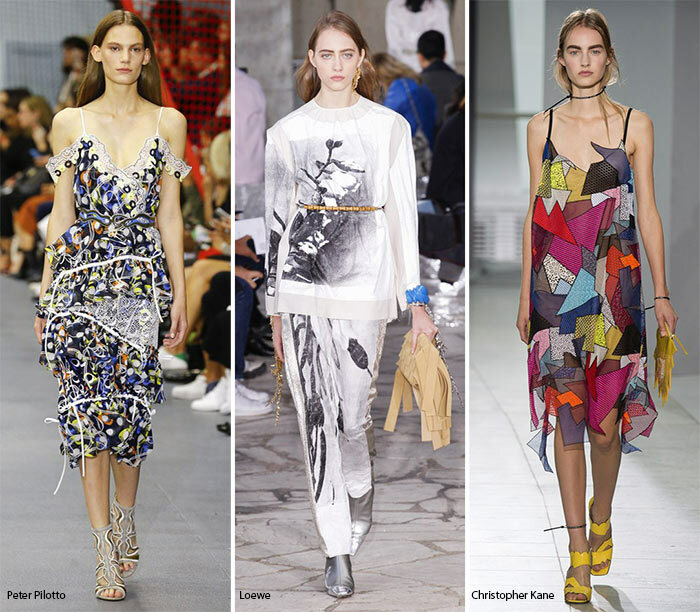 They are not your typical spring/ summer 2016 prints seen in Paris or otherwise on the more chic and sophisticated runway shows in general, but they most certainly looked incredible as we saw them appear on those high-end top of the line designer collections. This included shiny voluminous skirt suits with long jackets at Rochas, bolder and more artistic than the Chalayan prints, where the look was barely visible at all on those white floor-length dresses. We saw them appear on mini hemmed looks in green on Giambattista Valli and Paul & Joe, while the likes of Guy Laroche paired a gorgeous olive green jacket with the hidden Hawaiian prints with calf-length tights and strappy sandals underneath. 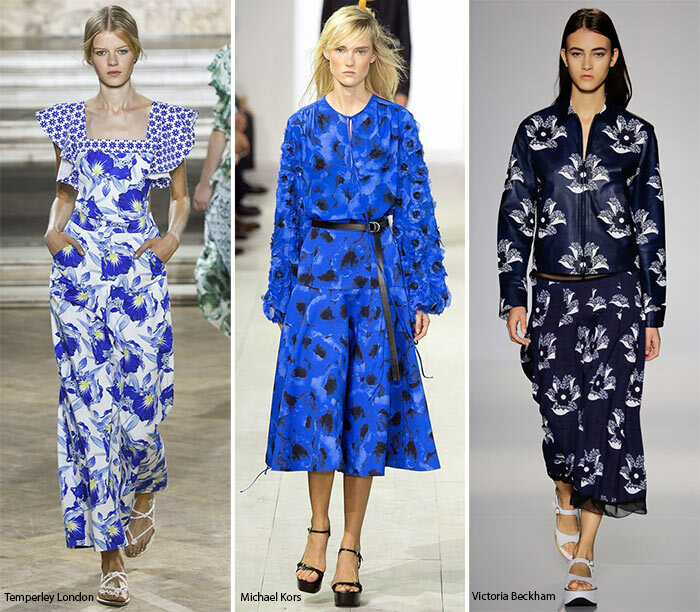 This is possibly one of the more intriguing spring/ summer 2016 print trends that has been going on with weaker but steady strength since the last few seasons. 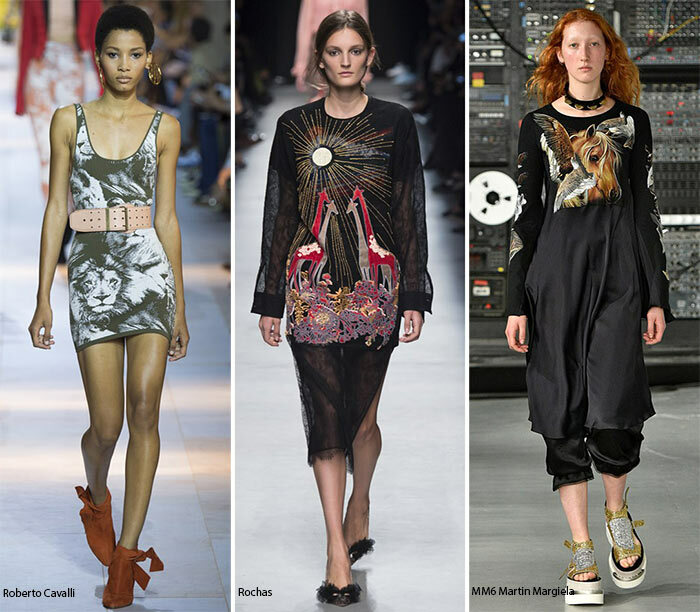 It looks fantastic as well, with animal features appearing on the runway in clear detail – as opposed to simply being the print of the hide – throughout the Fashion Weeks around the world. In London, MM6 brought in a horse with certain wing-style additions, while Marc Jacobs brings in some horseshoe and farm-related prints on a slightly rounded plunging neck vest. If you love snakes, it is Gucci’s collection this year that features all types of interesting snake prints appearing on mannish suits and skirts and tops, offset by the pineapples on the wide tailed ties. The world is a beautiful place and there comes a time when designers are going to turn to some geographic prints to sate their curiosity in bringing that beauty onto the fashion floor. 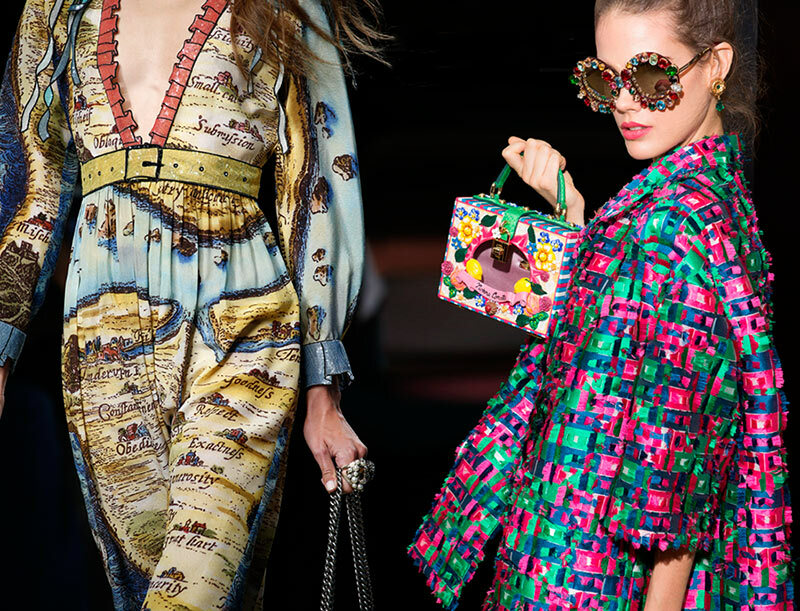 In Gucci’s case, we saw rather intriguing shiny map skirts falling to midi level that really caught our attention, while Dolce & Gabbana used famous Italian sights as perfect prints to decorate their elaborate designs. Stars were huge though. They really made a splash and looked like childhood stickers pasted onto pants and all. Dresses, denim and other garments find themselves adorned with stars! Creatures of the Wind brings it in with a bone colored set, high waist and open midriff and all, wherein the stars appear on the pant legs down to the knees. If you like seeing flags on the scene, check out Lacoste’s flag skirt with all the patriotic stars hanging there. Almost floral looking stars come into play at Karen Walker, while we enjoy the effects of a star spangled sky. 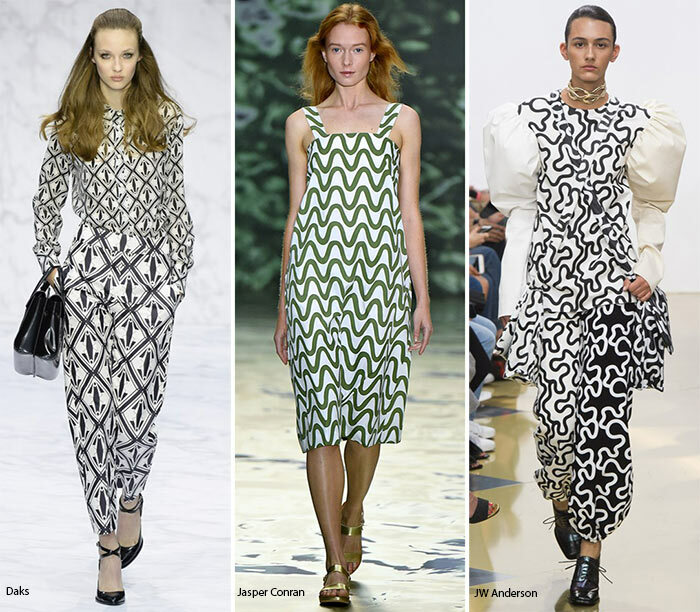 It is not as common as we may want it to be, but the optical illusion prints are actually rather numerous on the runway shows for the coming season. 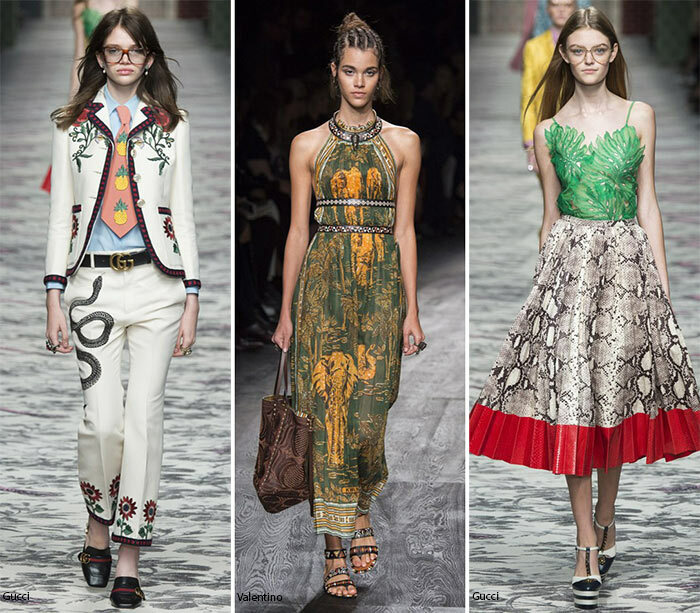 Dries Van Noten brings in interesting tops with cinched waists featuring a lovely green and yellow swirling pattern. The contrasting black and white swirls at J.W. Anderson are rather intriguing against the sea blue zigzags appearing down the middle of the mini skirt, while Daks brings in black and white mirrored prints for even more confusion to your focus. It looks like paint was brushed onto the cloth at time, with strokes appearing here and there, particularly on a beauty such as the Prabal Gurung collection that left the bare shouldered slide slit look appear utterly breathtaking. Gorgeous aesthetics appear on organic prints with elegance and artistic creativity, the brushstrokes often bringing in the natural world, the beauty of it captured especially well on the Jasper Conran Fashion Week runway show. 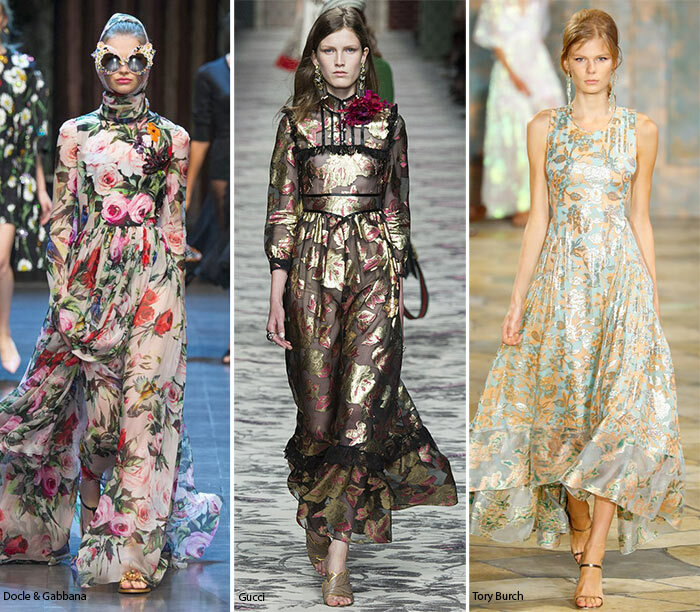 There are a lot of floral prints in all sorts of different styles for the spring and summer seasons it appears. This includes the Victorian offshoot of chintz, very different from the large poppies seen in New York. 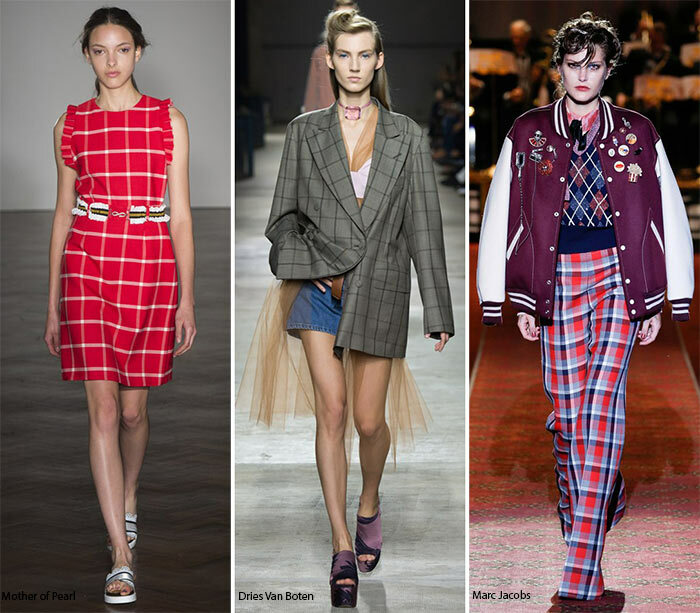 It was a big London trend and included small flowers and softer designs, from the spotting of it at Markus Lupfer, to the gorgeous English look in a button-down piece at Vivienne Westwood Red Label (the preferred Vivienne Westwood line). Topshop Unique brought in the chintzy prints for wraparound robe tops and tight fitting ankle cropped pants, while Emilia Wickstead had the more abstract mixed with the clearer florals in contrast with Bora Aksu’s quaint and almost gem-like quality to its florals. 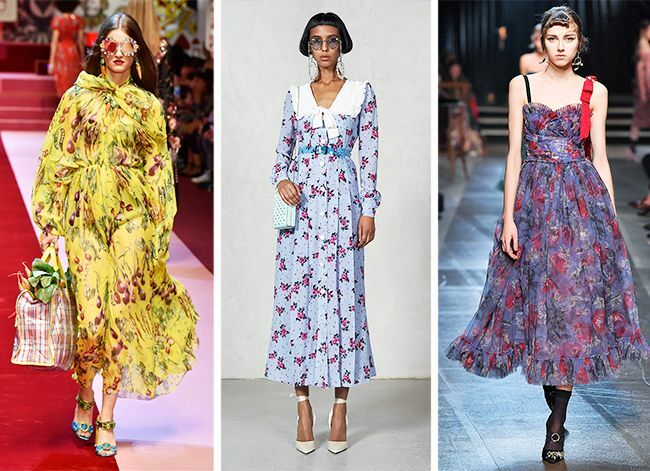 The off-the-shoulder look – a rather huge trend on the runways for spring – at Temperley London was simply beautiful with the chintz effect to it, something seen at Jonathan Saunders, Emilia Wickstead, Duro Olowu, Mary Katranzou and Mother of Pearl as well. Add a yellow background and pretty Victorian ruffles to the likes of Erdem and it looks positively amazing. And then, of course, there is that whole defining look in the voluminous Delpozo gown from the New York catwalk. Marble is one of the most interesting spring/ summer 2016 print trends that take over the runways left right and center, appearing with rather interesting colors throughout. It brings styles to life with a rather vivid intensity and allows for a very bold and graphic finish to the touches made on the designer items. The print appears on both garments and accessories, the Valentino pieces looking rather striking with the pops of color and sheer detailing. 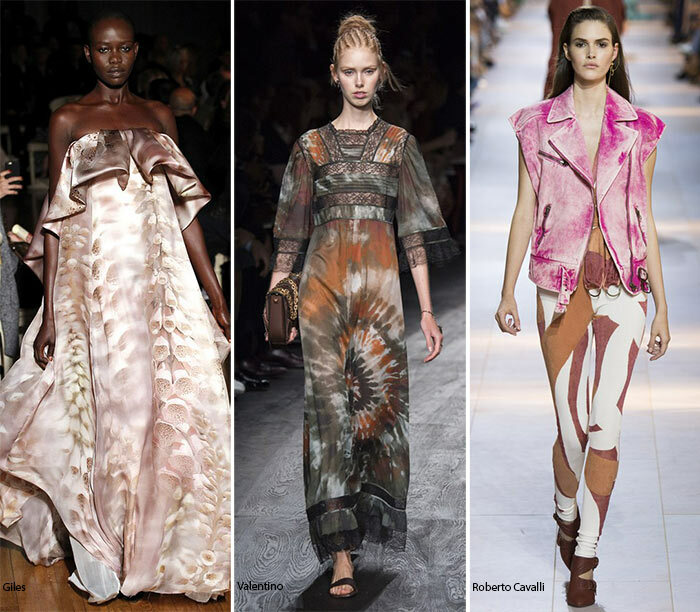 It’s more about the fluid and digitalization of the prints appearing on a couple of Roberto Cavalli designs with the strong impacts and the shades of rust, light brown and white. Possibly one of the more common spring/ summer 2016 print trends seen on the runway was the whole print blocking businesses. 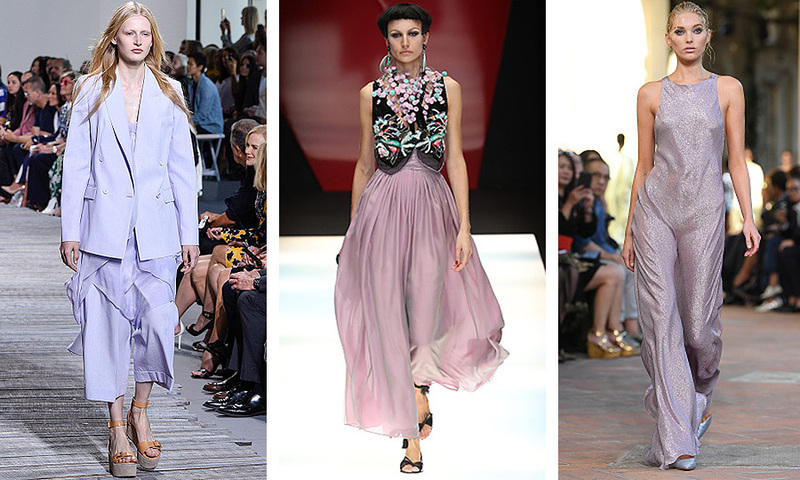 You know how color blocking includes putting together large chunks of monochromatic hues? Print blocking actually has to do with using very clear prints of highly different trends together, mixing and matching to create the latest fashions. It was big in New York and everywhere else as well, but in the former we saw it appear at Victoria Beckham, BCBG Max Azria, Diane Von Furstenberg, Tommy Hilfiger, among others. Diane Von Fustenberg made this print blocking business look really good, what with the bubblegum pinks and Barbie designs, the plunge to the neckline and the wraparound effects to the dress. 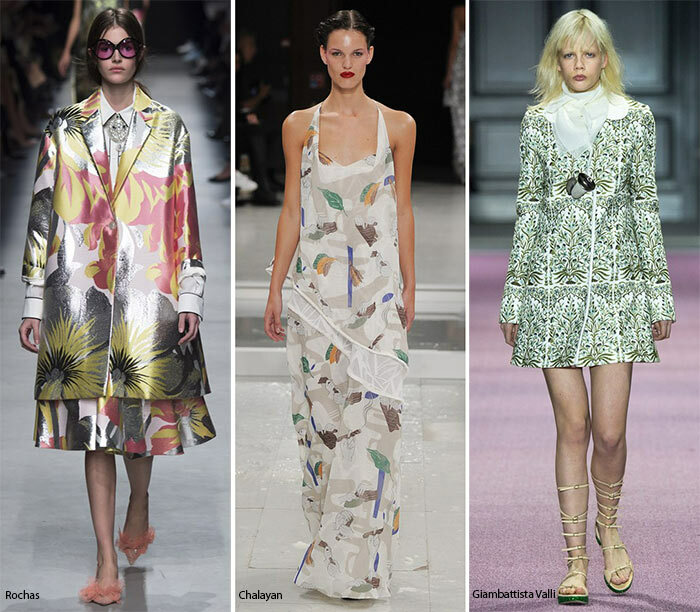 Different types of flowers appear in swatches of print, making it all come together in a cohesive manner, unlike the crazy contrast seen at Victoria Beckham. London brought in print blocks from Jonathan Saunders with his gorgeous fluttering dresses, Emilia Wickstead with her red carpet worthy gowns, Duro Olowu with those incredibly floral blocks, Mary Katrantzou with the psychedelic colors, Mother of Pearl with the gradients leading to midi hem and knee high boots, Coach with the chintzy florals, etc. 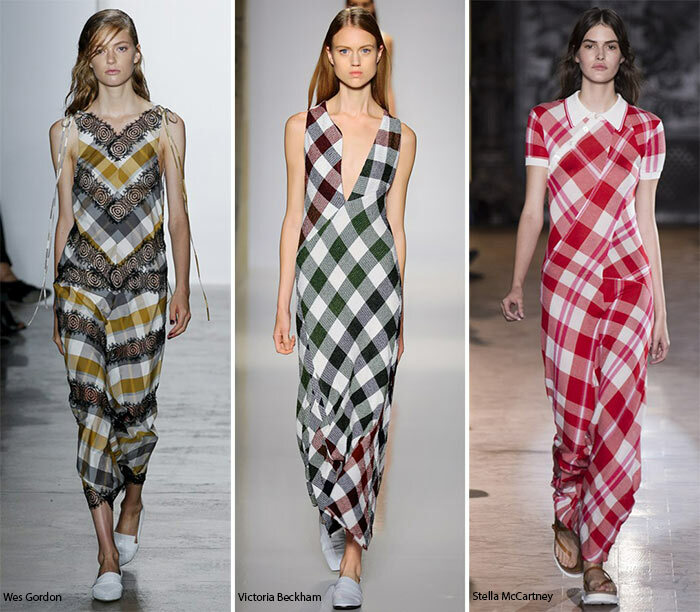 While plaid is a rather large print trend for spring 2016 on the runway, in bold colors and bolder designs, the smaller more geometrical and clearly lined checks are even more interesting and appealing to the human senses. They come in shirts and jackets, belted or simply hanging about, both garments of which appear on the Miu Miu runways. They may be smaller at Marc Jacobs as well, but certainly not as small as at Miu Miu, with an addition of shiny material and shimmering backgrounds, a whole lot of sparkle left to go around. There are floral prints that can look quite realistic and also very much on the romantic side with the way they have been positioned, the types of garments it is worn with and the background colors all ending to a rather Victorian but often simply love-inspiring effect. 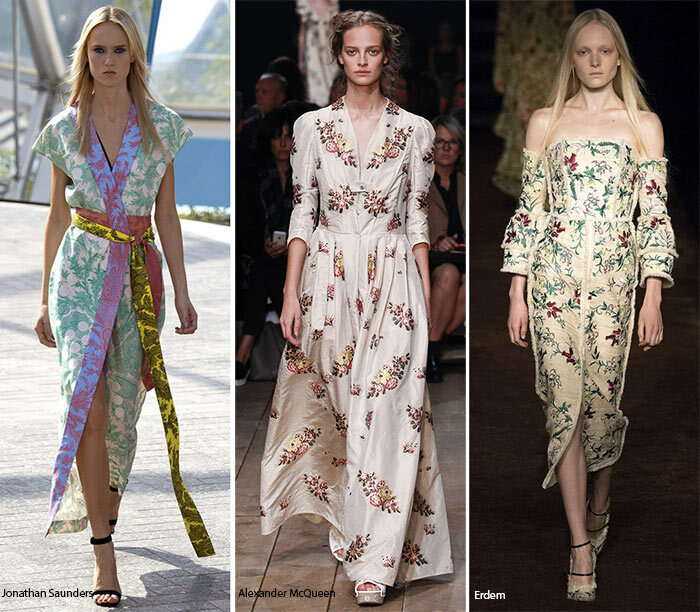 Romantic versions of the flower prints for spring 2016 come into effect on Alexander McQueen, Gucci, Tory Burch, Oscar de la Renta, Etro and Erdem, each with its own version of what the print should look like. While it’s vines of flowers in multiple panels at Erdem, there is a spattering of the designs on the bare shouldered Tory Burch dresses. Black lace effects around stark white backgrounds to the bloody red carnations adorn the Oscar de la Renta designs. It only gets all the more romantic when you add some Philosophy by Lorenzo Serafini in there, what with the abstract effect to the transparent fabric barely covering up the body. Romance against a denim finish can be found in another part of Alexander McQueen’s collection, what with the Western Fabric cut beautifully to bare a bit of the belly while still maintaining its luxurious feel. She’s a cowgirl with a stylish attitude. 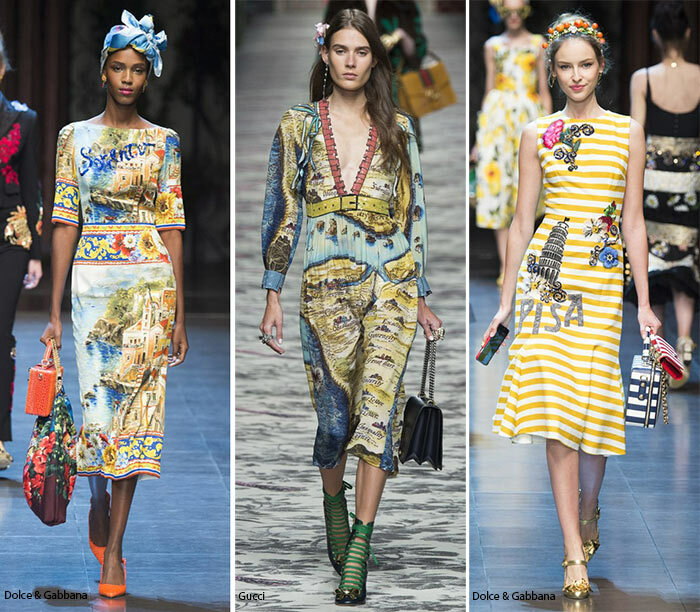 Dolce & Gabbana’s lemon hued floral print dresses are one of the biggest trending looks from the Fashion Weeks, taking away the saccharine of strawberry and giving it all a very fresh outlook. Even Coach has something romantic going with its drop waist prairie dresses that we can imagine appearing on a very country-oriented show. Like a good modern abstract painting, there are a few clothing styles where the prints take on a whole new dimension as is the case with the sparkling multi-colored slip of a dress at Tom Ford that really shows off the chest region in an uncommonly artistic plunge. At Peter Pilotto, the abstract effect of the bold colors actually almost reminds us of Christmas lights, bare shoulders and layered skirts and all. Wacky and abstract pants are seen at Loewe as well, while nothing can beat the silver beauties at Maison Margiela. Just as it is expected from Maison Margiela, we equally expected interesting abstract artwork from Christopher Kane and we were certainly not left wanting or disappointed. Colorful patchwork creates a slip dress that can be worn everywhere from barbeques to wedding ceremonies. It is a versatile piece and a favorite for the upcoming warmer seasons. We see paintings of all types, but instead of brushstrokes, here we have some intriguing watercolors that take on the iconic works of master painters. There is a certain romance to these and a blurred expressiveness that highlights femininity on runway shows such as Calvin Klein, with its matching floral sets, BCBG Max Azria with its blue and purple florals against a gorgeous white background, the skirts matching with the jacket thrown on top, as well as Simone Rocha with the incredibly spring look to the light feel of the dresses that add crisscross glass beading to the chest. 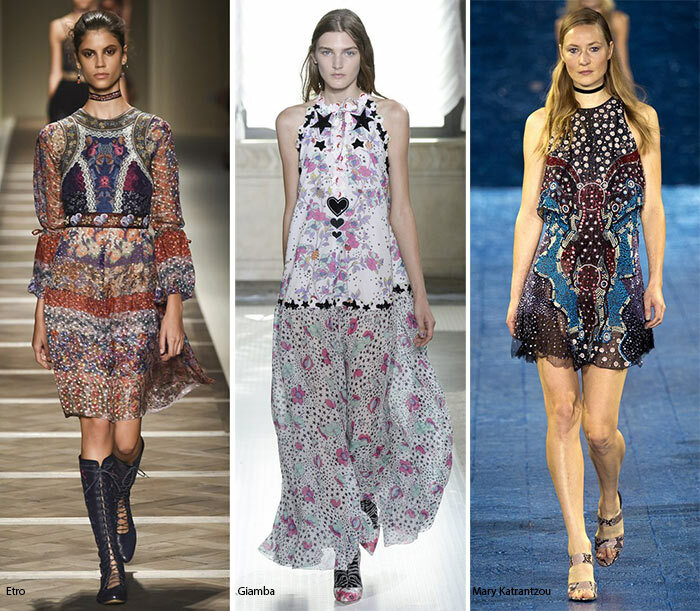 When it comes to the spring/ summer 2016 prints, not all of them need be geometric or floral accented. Sometimes they include words. In this case, a few designers opted to write their pieces on their garments, a creative process presented that uses imperfect or amended slogans. There is hand-written topography as well as doodled words and repeated phrases. Even scribbled motifs appear here and there. Christopher Kane is most certainly among this list, with some rather lovely pieces to boot, fringed edges and all. We see Each x Other come in with sweater dresses that have cleanly typed up word drafts on it, while Ashish loves the scratches and doodles very much.